The killing fields of Guatemala's central highlands are full of bones, buried but not forgotten beneath the rich, dark soil. And now people are digging them up, mourning their loved ones at last in churches and cemeteries. They're uncovering the secrets, too, hidden away in the bones all these years. After the war's end, the country of 12 million remains fiercely divided between rich and poor. 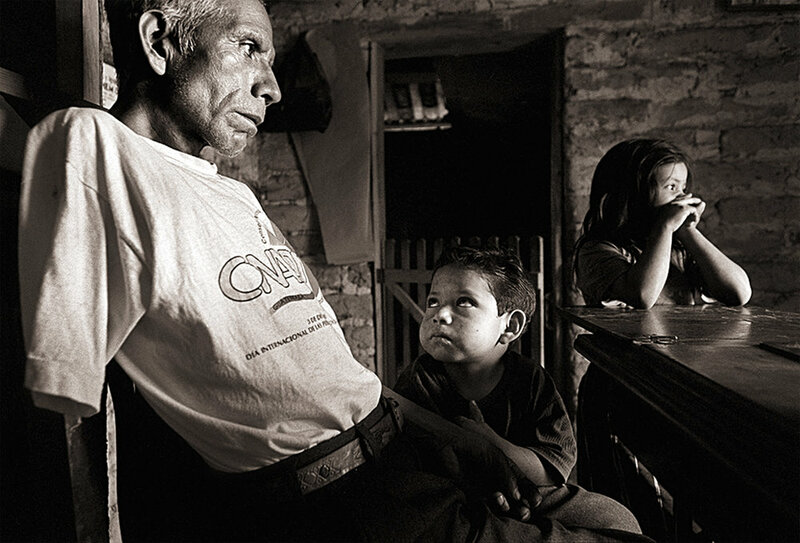 What hurts most, Guatemalans say, is that 36 years of dying accomplished so little. "Look at me," screams Evangelina Loyo to riot police, "I'm sick and I'm old. I pay six Quetzales to go to work every day--and I can't even buy a tomato." The protest, which began as a hunger strike by Universidad de San Carlos students to protest the increase in bus rates in Guatemala City, escalated into a riot involving hundreds of people in the city's center in the spring of 2000. Two days later, five people were dead and 17 buses destroyed. The president demanded a reduction in the bus rates thereby ending the country's worst unrest since the civil war ended in 1996. 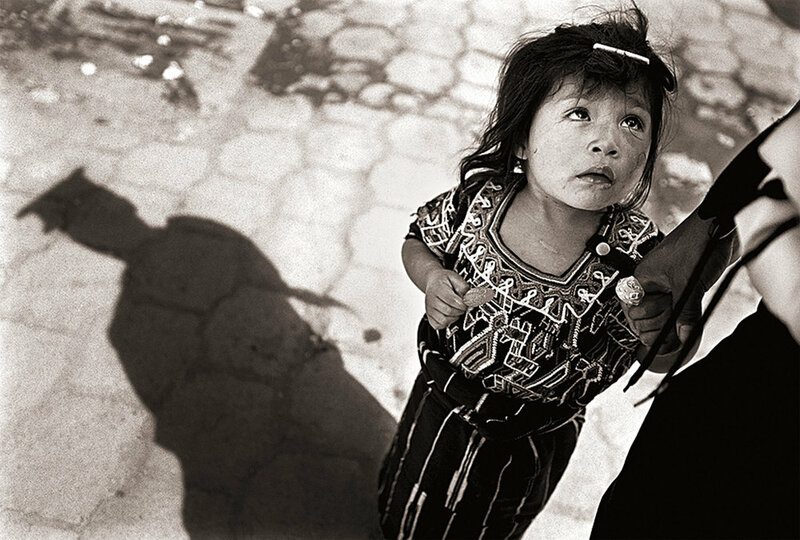 © 2000 Cheryl Diaz Meyer. All Rights Reserved. Claudia Molina, a communications student at the Universidad de San Carlos, participates in the largest annual student protest against increased bus rates in Guatemala City, Guatemala. Riot police slowly back away from an angry crowd that had stoned a passing bus to protest the increase in bus rates in Guatemala City, Guatemala. Four years after the country's 36-year civil war ended in 1996, the country struggled to overcome its brutal past. Mayan priests Pedro Corio and Tomas Brito visit the Cementerio General in Nebaj to perform Mayan rituals for the diseappeared of Guatemala's 36-year civil war. A police officer calms a lost girl with lollipops near the Nebaj marketplace shortly before the tearful mother and daughter were reunited. The Policia Nacional Civil, developed in compliance with the 1996 Peace Accords, today works to fight crime, reduce gang violence and resolve civil issues such as domestic violence. 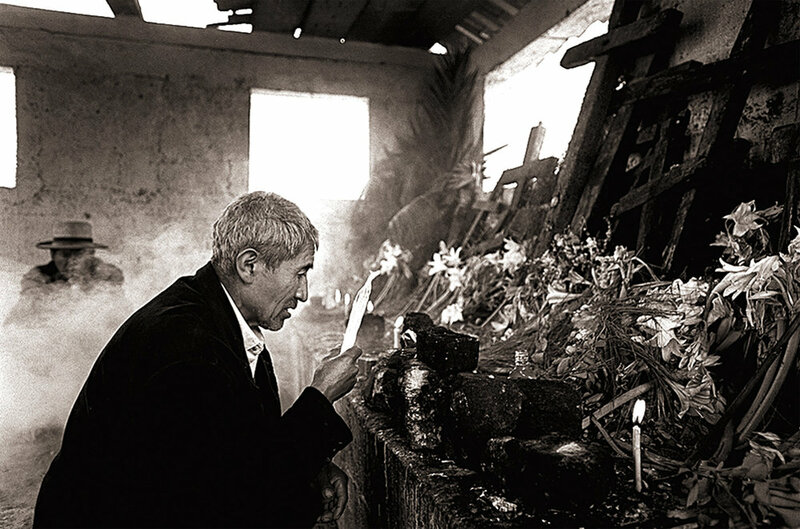 A small coffin becomes the final resting place of Tomas Tian Mejia, murdered in 1982 by the Guatemalan army. His widow, Isabella Mejia, placed the bones of her late husband into the coffin after they were turned over to her at the Iglesia Catolica de Chichicastenango. The bones of 23 people, including her husband's, were discovered and exhumed from a massacre site in the nearby village of Chupol. During the war, Pedro Bernal was a member of the Patruya Civil, civilian patrols forced into service by the Guatemalan army, when his town was overrun by guerillas. His arm was shot off as he fled an attack. Today, he lives in Nebaj with his two sons and grandchildren, David and Cristina. As the sun sets over mountain peaks, Mayan priests Tomas Brito and Pedro Corio visit the Cementerio General in Nebaj to perform Mayan rituals honoring the dead and disappeared of Guatemala's 36-year civil war. Mayan priests Domingo Morales and Cristobal Velasquez perform a traditional Mayan ritual to calm the spirits of 23 massacre victims in Chupol. Only three families came to claim their relative's bones and participate in traditional ceremonies for the deceased, as fear is still rampant in the Guatemalan countryside where thousands were brutally killed during the country's 36-year civil war. Widows Isabella Mejia and Maria Macari tread carefully as they depart the Iglesia Catolica de Chichicastenango carrying the bones of their late husbands home to their village of Chupol, Guatemala. Mejia and Macari's husbands were massacred during the country's civil war.